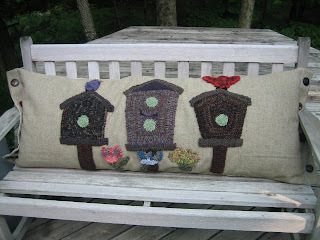 This is my version of the birdhouse pattern from the Kingwood hook-in! Most everyone did theirs as a rug but mine is a bolster for the bed. 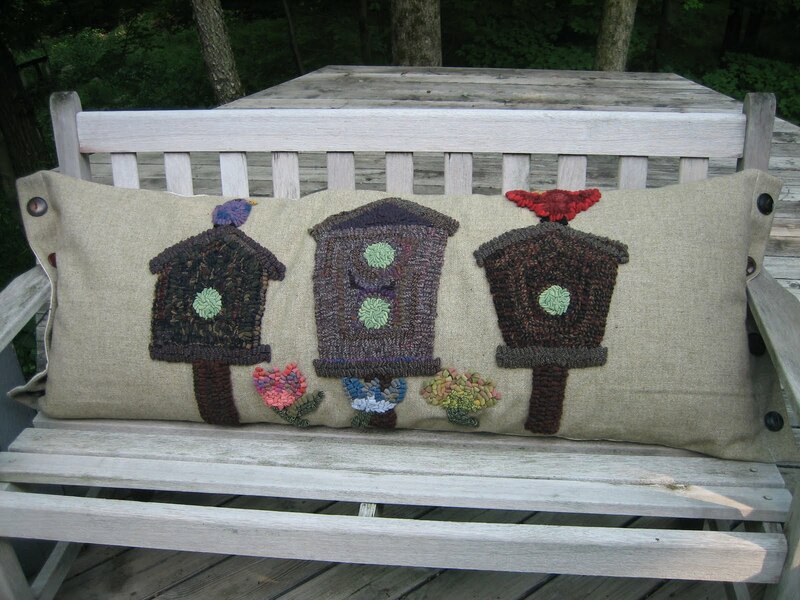 We got these patterns last year ~ I started hooking mine last Monday before the hook-in ~ I made it into a pillow Saturday morning before we left!! Procrastinator is my middle name! But it turned out really cute ~ I work well under pressure ~ most of it self-imposed! Rarely, do I win anything but Saturday was my lucky day!! They had a Chinese auction with really nice prizes but I put all my tickets in this drawing and Happy Day! I got to take it home! It is really large ~ my hooking frame is inside ~ and is made out of beautiful fabric!! And this sweet girl, Rhonda, is the one who made and donated that great bag to the auction! Rhonda of My Glory Stars blog (the link is in my blog list to the left) is a good friend of Katie's and helped at check-in all day! I love this frame bag and love her generosity! Katie had wonderful door prizes that day, too, and we each got a cute little wool favor as we checked in! A great day was had by all! 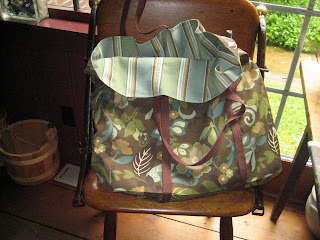 Some of the blogs tell about their thrift store finds ~ this is mine! There is a new little shop in Port Clinton with 'gently used' high-end household decorating items ~ these pillows were $6 each ~ they look brand new and are striped on the other side. They'll work great for the benches on the deck ~ in case we have a party ~ or even get to sit out there! Last night, we went to Summit Motorsports Park in Norwalk to meet up with my nephew from Florida who is a dragracer. We had a little family reunion of sorts ~ his sister and two of my other nieces came ~ it was fun. My son, Tad, even stepped out of his comfort zone and joined us for a cookout ~ Scot took him on the golf cart as he guided various family members back to his motorhome ~ it was a fun evening ~ in between some really wild thunderstorms ~ Scot told me today there is a big tree down where our car was parked!! Glad we left before that started! That's is for today ~ it's 1:20 a.m. ~ seems like it's time to turn out the lights! Have a good day! Last Saturday, friend Heidi and I went to the hook-in at Kingwood Center in Mansfield ~ it was put together by Katie Allman with lots of her friends as her support team! It was really nice and there were hookers in abundance!! 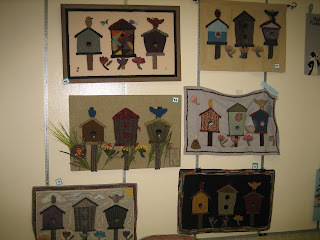 All these birdhouse rugs and wall hangings were part of a challenge that Katie set up last year ~ we bought a kit with the patterns drawn on wool, some instructions as to what we were to do and the wool to do it! There were 19 very creative entries! 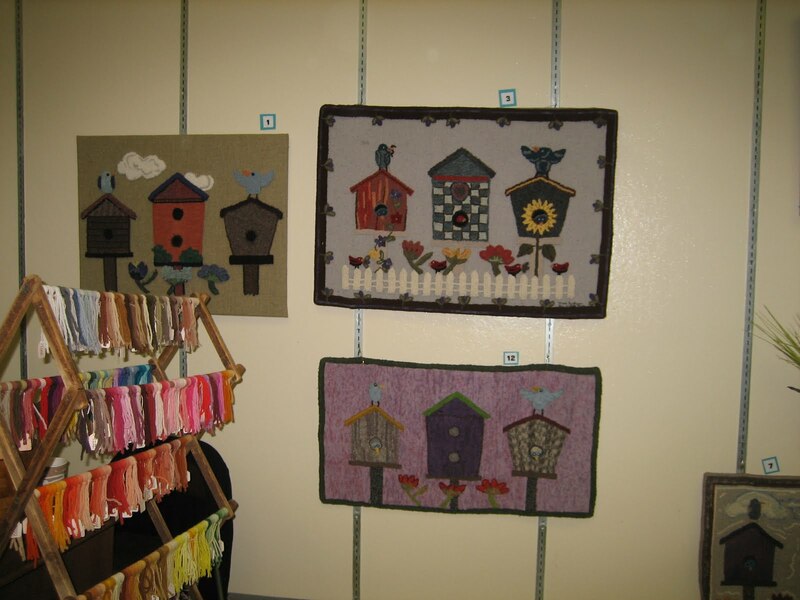 The second photo shows some framed, some with the entire piece hooked, others with just the design itself hooked. 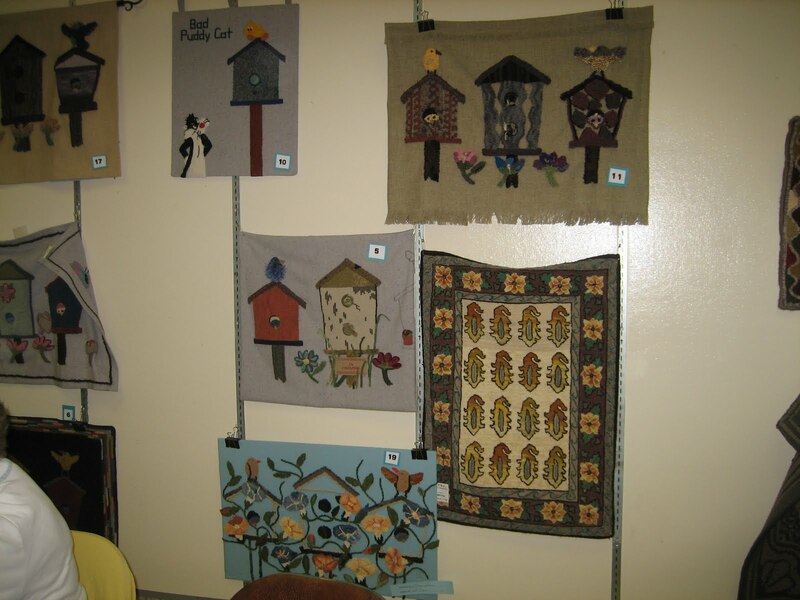 The third photo shows the winner of the People's Choice award ~ and that was the one with one birdhouse and Sylvester and Tweetie Bird! Both the cat and bird were sculpted and those were added by the artist who hooked it! Tomorrow, I'll show you my entry along with something I won! I actually took a lot of pictures that day but a lot of them turned out dark and disappointing!! So, I have two more to show you ~ this is Topsy Turvy, designed by Bea Brock of Hill Country Rugs and I had just ordered this pattern from Bea to be picked up at Sauder this summer. I really like the dark old look of these two roosters. I love this rug! The colors are bright and dramatic against the dark background ~ it really was a stand out! The walls were covered with rugs and all of them good ~ we have lots of talented rug hookers in our area and some of the gals were even from other states!! I don't think a lot of hooking gets done but there sure is a lot of talking and shopping and comparing notes going on ~ it is a wonderful day of sharing for sure! Ours was a busy weekend as usual ~ Friday night we met some of Sonny's old school buddies at a car show in Galion ~ that's where he graduated from ~ he loves car shows so that was right up his alley!! On Saturday, while I was hooking, he went to great-granddaughter's 2nd birthday party and that night we met his class mates for dinner ~ a once a year gathering now since a lot can change in five years, which is the usual time between reunions. We had fun ~ I like his friends and their wives ~ it was a good thing! Sunday, I had yet another open house on the house we're selling here in Lexington ~ not a soul came (it was Father's day for pete's sake) ~ I was lonely ~ good thing I took a book to read! Sunday night, we went to son Ted's for dinner ~ a really good dinner, too, by the way! And tonite, we attended 3 ballgames ~ and ate supper from the concession stand ~ woo hoo! It was fun for us ~ we definitely see a lot of our kids and grandkids ~ and one of the good things is we re-connect with the parents that we sat on the bleachers with oh so many years ago ~ and get to watch our kids' kids play ball ~ it takes us back to what was definitely a more simple time than today. About another week and a half and life will be back to normal! I hope your life is 'normal', whatever that is ~ enjoy the life you're living today ~ Bloom Where You Are Planted ~ a little saying on a magnet on our range hood that tells us to be happy wherever you are in whatever you're doing! We're making every effort!! Hope you do, too! This is one reason I'm not blogging very much!! Little League games!! We have six grandchildren playing ball here in town and we go to as many games as we can!!! Son, Teddy, is the coach of Luke's team ~ so that's fun for me to watch, too! 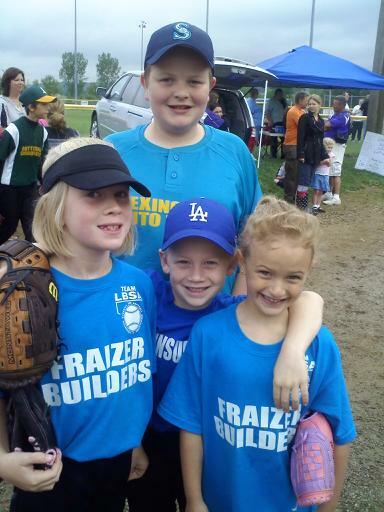 This is Luke, Jordyn, Logan and Luci ~ happy looking little crew, aren't they? This is Jakob, Jordyn and Logan on Opening day ~ Camden plays, too, but he was not available for photos that day! In other words, he was being a little twirp! We came home from the lake that day and attended four baseball games!!! And that night we went to Luci's dance recital ~ she was the cutest little fairy! But by the time we got to her after her dance, she had ripped off that darling little fairy dress and was back in her regular clothes!! She is really growing up ~ they all are! That's why we try to go to as many events as we can squeeze in! 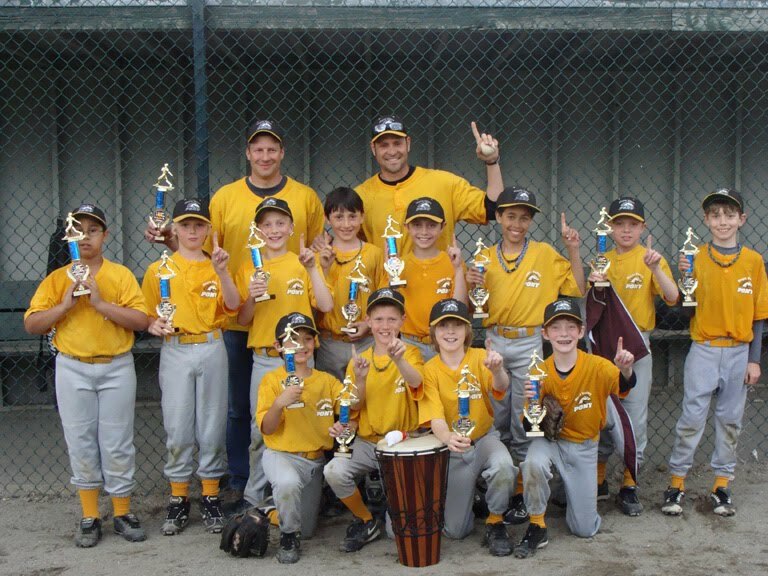 This is my Seattle son, Chris ~ showing that they are #1 ~ and "Catfish" Hunter ~ on his right! They were 19-1 for the season and won the tournament championship on Monday night!! A happy bunch when they called to share the good news! 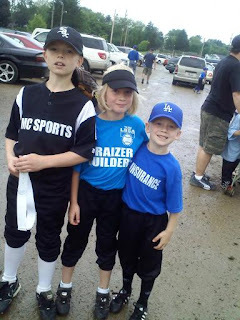 We went to two of their games while we were there in May ~ we travel far and wide to see a grandkid play ball! CONGRATULATIONS INDIANS!! Life is busy here ~ I have been having Sunday open houses, at this little house we have for sale. It was a rental for many years and was in dire need of repair when it was vacated last October. Sonny and his son, Brian have worked so hard for the last six months to make it all new and shiny ~ and rather than rent it again, we are selling it! Everything is brand new inside and will make a wonderful new home for some lucky family! Yesterday, I gathered up four grandchildren, brought them here for lunch and took them out on the bike trail for a 'walkabout' !!! There is a swampy area along one part of the trail where Luke and I have seen turtles bathing in the sun so I thought that would be fun! No turtles ~ just one lonely frog sitting on a log! We walked pretty far ~ Jakob offered to carry Luci piggy back for part of the way because she got a blister! But the shoes she wore were very CUTE!!! Then we went for slushies and then we went to Gorman Nature Center and saw snakes, owls, flying squirrels and a falcon. They were closing for the day so the volunteers could go catch 'food' for their residents so we didn't stay long ~ we'll go again when we have another field trip! It was fun ~ these little cousins are all close in age and really enjoy being together! And last night we WENT TO A BALL GAME!!!!! That's it for today ~ off to write some checks and get ready for a busy weekend which includes a hook-in for me tomorrow ~ yay!! Someone suggested maybe we slow down and smell the roses ~ I said we go a hundred miles an hour because we're afraid if we stop, that we'll start growing moss!! And we think this crazy life keeps us young!! Heidi and I traveled to the Fairlawn Library on Tuesday to hook with the gals!! We haven't been there very often lately ~ it was fun! This is Betty Young's little flower basket ~ I love the yellow greens and it's more primitive than what I usually see Betty hooking! Kim is a cheerful looking girl, isnt' she? And so is her rug ~ I love the way she hooks even though she was thinking she should be hooking more even ~ her rug has lots of texture! Linda and I met at the Western Reserve Hook-in last month and she's a fun gal for sure! 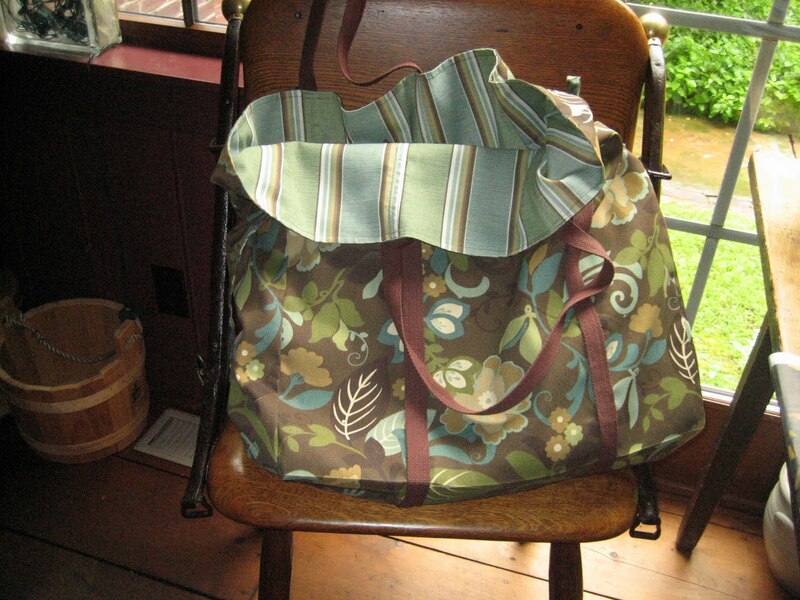 Look at this great tote bag with leather handles that she made!! It's quite an eye-catching piece!! This is Karen's latest rug and I have to tell you, I always love Karen's color choices ~ dark and dramatic and yet, antiquey looking! 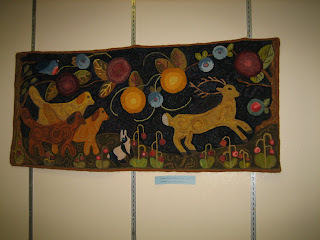 Judy is really hooking a rug with large design to it ~ her hooking is beautiful ~ very even ~ and her colors are really soft. This is going to be a really nice rug! My friend, Arlene, drew this fishy rug herself! 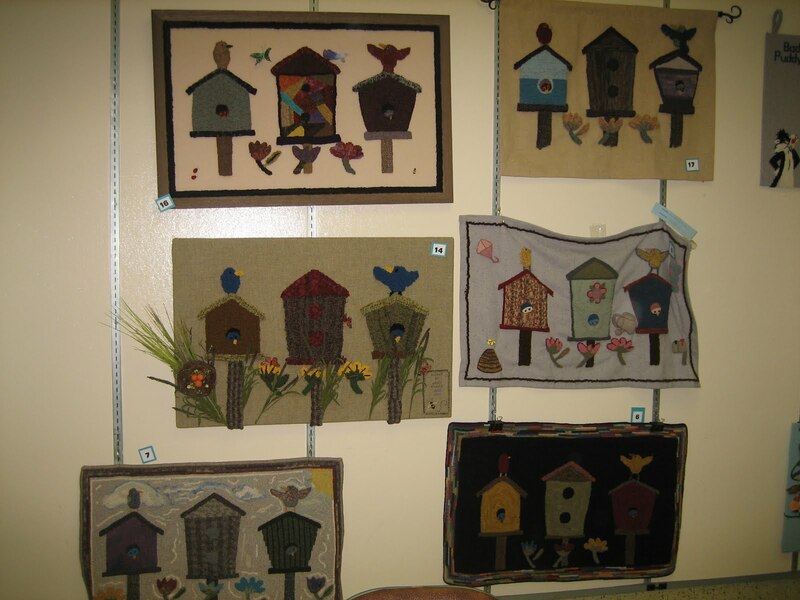 And then took it to a class with Gail Dufresne ~ it has some interesting techniques added to it like clipped hooked loops ~ that gives it a little different look along the spines of the fish skeletons ~ cute rug , Arlene! Look how happy Shirley is!! That's because she loves her animal rug that came from a Barbara Carroll workshop and because she's hooking it on one of our frames!!! Don't you love her purple moose ~ Shirley hooks whimsical things ~ and that's why she's smiling! Concetta appears to be taking a small nap during her photo shoot!! But she's smiling because she is binding this fine cut rug ~ I would be happy, too, to have it finished. It really looks like a picture doesn't it ~ Concetta has pulled lots of little loops to make this beautiful rose rug. And last but not least, Barbara and her Uncle Sam! She was working on a cute little floral but wanted the finished rug in the photo! Barbara comes from Ligonier and used to be a regular student of Barbara Carroll ~ go glad she found the library group to hang around with! I like her attitude! There is a picture of Heidi, too ~ she didn't get much hooking done that day ~ and if I want to stay friends with her, I'll keep the photo to myself!! We'll get Heidi on here another day! We had a good time with all these gals ~ love seeing what they're working on. 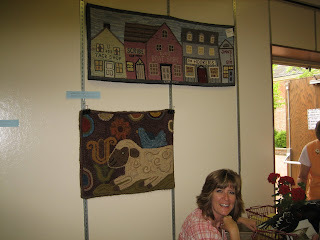 Oh, we had another one who didn't want her rug on at this time ~ dear Jane ~ and her rug looks great!! Next time, Jane and Heidi, will appear together!! We left there early ~ I had a nail appointment I could not miss, had to show a house we have for sale, and then had guests coming for overnight! Our friends, Danese and Ted, left for Hilton Head yesterday morning for their new home ~ so that evening we ate, drank, and were merry to give them one last good memory of Ohio! We'll miss them but they've invited us to visit and no doubt we'll take them up on that invitation! Danese mentioned starting a blog and I encouraged her to do that, wholeheartedly! What a perfect time in their life to start sharing what this kind of transition is like ~ leaving a home of 50 years and building a new life ~ it can run every emotion, I would imagine from sad to funny to ridiculous to sweet!! I hope she goes with it ~ and when she does, I'll link it from here! Now, I'm off to take Tad for an appointment and a hair cut! And then back home for office work ~ I've been fooling around with my computer for the last several hours trying to upload my pictures ~ it quit doing that the other day. Now, I have to upload them on Sonny's computer, email them to meself, copy them to the photo gallery and then begin my blog!!!!! That is wayyyyyy too much work ~ I need a little computer whiz to figure out my camera/ computer connection!! At any rate ~ I'm off! Hope you enjoyed the rugs ~ and we'll meet here again, soon!! Thanks for stopping by! This colorful group of gals came to lunch a couple of weeks ago and wonderful guests they were! I told them to watch for a picture on my blog and although, it takes me a while ~ here you are, girls! They came from Mansfield, Toledo, Cleveland and Delaware ~ long time friends who travel far and wide to have lunch together!! Thanks, girls ~ hope you enjoyed your visit! Along with a luncheon and home tour, part of their visit is a tour of our gardens. Sonny and I worked really hard in the week prior, spreading eleven yards of mulch (which was a mountain of mulch, believe me!) and getting things all spruced up for their viewing pleasure! This is the garden gate that leads them into the courtyard garden and into the house! To the left, is a gorgeous lantana ~ very showy! This is on the breezeway that connects the house and garage ~ a collection of little bell jars around a basket of mixed flowering plants. 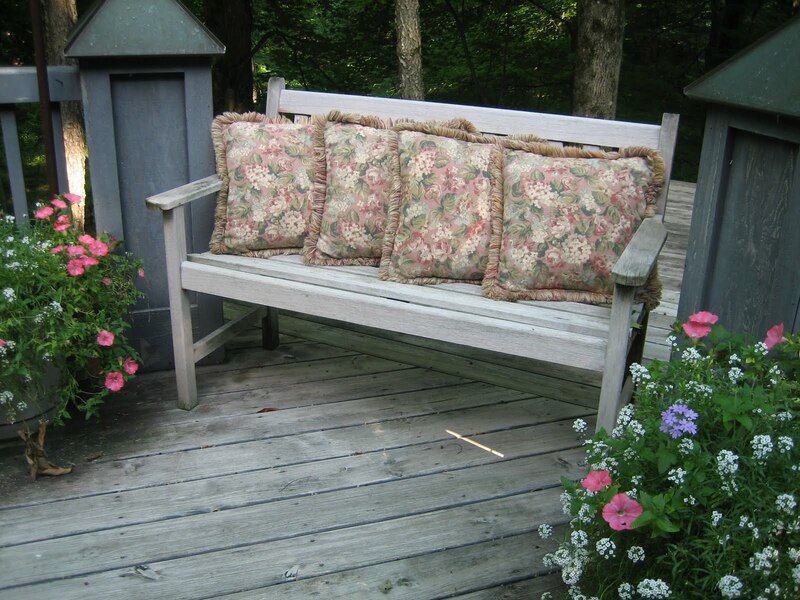 That bench is very old ~ it's a corner bench and the seat lifts up for storage. An old enamel pitcher filled with peonies and hosta leaves greets our guests as they come in thru the back door ~ 'back door guests are best' you know! If the front door bell rings, I know they don't know us! Although it's inviting ~ our friends and family always come in the back door! The back deck is adorned with flower baskets and ferns ~ I'll tell you a little secret but don't tell a soul!!! I buy hanging baskets all planted with beautiful combinations of flowers ~ set them in containers and cut off the hangers!!! Instant color in short order!! And anyone who knows me, knows I'm always operating against the clock!! God bless our local greenhouses ~ I know they'll have just what we need! Our little patch of front yard coming out that front door and the brick walk that leads to the driveway. Although we have almost 14 acres, it's mostly woods and there really isn't very much grass ~ little pieces of yard here and there! You probably think how restful and peaceful this area is and how we must enjoy sitting here listening to the waterfall ~ sure ~ yeah, right! We don't do a lot of sitting but if we did this is where it would be! Hope you enjoy your tour of our yard and gardens ~ there are a couple of more photos that I'll post the next time ~ I thought this was enough to see today! Come again ~ and if any of our Red Hat guests are reading ~ thanks for stopping by and Vivian (my friend who helps me) and I hope you'll come back, too! We went to our friend's auction (they're retiring to Hilton Head - lucky ducks!) and we were able to 'win' the bidding for this great old red cupboard!!!! I told Danese, when I saw this several years ago, that I loved it and now we are the proud owners!! Yay!! 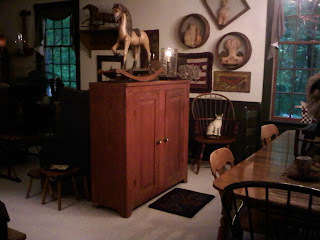 I have been wanting a cupboard to house the many sets of dishes that I have crammed in an antique dry sink and the cupboard above the fridge ~ you know how often I get those out ~ too high to reach, etc. So now, I have a place that will be very handy and it backs up a nice high settee and they serve as a dividing point between the dining and living area of that long room!! I'm a happy camper! 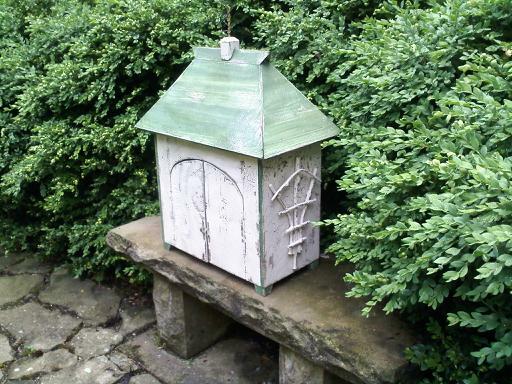 Another great find was this miniature potting shed that I had admired out by their very neat garden shed! For today's photo shoot, it's sitting on a nice old stone bench in front of our overgrown boxwood hedge!! Danese told me that it was on the cover of County Living magazine years ago and somehow she became the proud owner ~ now I am!! The doors open and the roof hinges back so it could be set up like a real little potting shed with miniature garden tools, etc. Maybe I'll work on that! At any rate, we had a great time at the auction ~ Heidi went with me ~ she is a long time friend of theirs ~ so it was bittersweet to know that our friends are leaving the area ~ but a fun day gathering things that we will love as much as they did! Sonny bought lumber for his lumber stash ~ much like rug hookers buy wool for their wool stash!! And he got a neat chimney pot and big thick piece of slate ~ he thinks he'll put them together to make a garden table!!!! I have been m-i-a in blogworld for the last couple of weeks. So much going on and I want to post pictures of the various things ~ I'll try to keep more current! I had a Red Hat group last week ~ I told those girls to watch for their picture ~ they must be wondering where they are. We've been to Little League opening day and dance recitals and all kinds of fun things ~ soon I'll post about them ~ I love to tell you about what we're up to but it seems like our world is spinning so fast, I can't get it all together!!! I hope it's smooth sailing in your various corners of the world and that summer is treating you well! Ohio has had it's share of rain and storms ~ although, many of them have passed by our little town ~ miraculously!!! Take care and I'll talk to you soon!! Thanks for stopping by ~ I love 'seeing' you!